A legislative committee aired two bills Thursday that would establish a state individual health care mandate and push back on Congress’s recent repeal of the Obamacare penalty, but the bills would impose radically different fines for those who fail to buy insurance coverage. The federal tax bill passed in December eliminated the individual mandate penalty in 2019. The result, the Congressional Budget Office projected, will be that the number of uninsured Americans will grow by 4 million people that year and by 13 million by 2027. The CBO also estimated there will be an immediate increase of about 10 percent in premiums because the risk pool that remains will be older and sicker. This year, the penalty for not having coverage under the Affordable Care Act (ACA) is $695 per adult or 2.5 percent of income — whichever is higher. Gov. 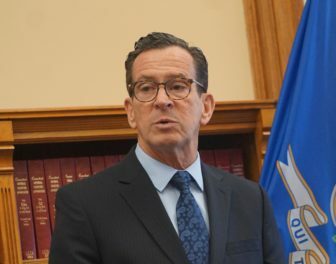 Dannel P. Malloy pledged during his State of the State address in February to propose legislation to preserve the most vital elements of the Affordable Care Act — including the individual mandate. Under a bill he submitted, residents would be fined $500 or 2 percent of their income annually if they don’t comply with the state mandate for the entire year — or 1/12th of that for each month not in compliance. Legislators on the Insurance and Real Estate Committee, however, have introduced a second bill, inspired by a research paper by Fiona Scott Morton, an economics professor at the Yale School of Management. According to the committee’s bill, if residents fail to have coverage, they face a penalty of 9.66 percent of their income each year, capped at $10,000. “This is the starting point of a long conversation,” said Rep. Sean Scanlon, D-Guilford, House chair of the committee. “We need to look at this issue from a perspective of not just initial shock, but really look at this from a big-picture perspective and that’s not easy to do. Scanlon also said some economists, including Morton, have argued that the ACA hasn’t been as successful as it could have been because the penalty was never high enough. Scanlon is also part of a bipartisan group that was convened by Lt. Gov. Nancy Wyman last year when ACA repeal attempts started. For the last several months, Scanlon said, the group’s discussions have included what to do if the individual mandate — “sort of the linchpin that makes the whole system work” — were eliminated. Rep. 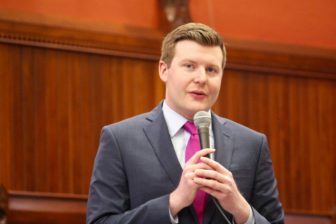 Rob Sampson of Wolcott, the ranking House Republican on the insurance committee, questioned the wisdom of a state mandate during a public hearing on the bills Thursday. “In my mind, there are only two reasons why people don’t have health insurance,” Sampson said. “Either A, they’re poor and they can’t afford it, and fining them does not seem like a really good idea to me. “And two, they’re free American citizens who are making a choice on whether or not they want to purchase a product, and fining or taxing them for that doesn’t also seem like it’s in keeping with our mission either,” he said. Others submitted written comments — which included issues with other components of the bills. Zack Cooper, a health economist at the Yale School of Public Health, said in his written testimony that if the state fails to introduce a mandate, there will be a jump in the amount of uncompensated care provided by hospitals in addition to increased premiums and more uninsured residents. The National Federation of Independent Business submitted testimony opposing the insurance committee’s bill.